Astor’s unique feature is its fast and unique telescopic extension system. 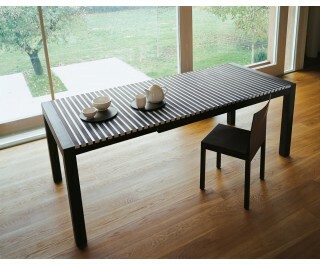 When the table is closed, the wooden table top slats are interspersed through thin aluminium inserts. It extends by simply pulling it as Astor Piazzolla would with his accordion, source of inspiration for the designers. As you extend the table, the wooden slats are evenly spaced, making the aluminium dies, which are otherwise hidden, appear in plain sight. This system defines a motion graphic effect proportional to the function of use. The table has a telescopic opening system. When the table is closed, the wooden strips which make up the top are spaced apart with thin aluminium inserts. Extending the table requires only a quick pull at one or both of its ends. The wooden strips distance themselves in a uniform manner, revealing the previously hidden aluminium sections. The top is made up of extruded profiles made from anodized aluminium, 2 mm thick, with side caps made from polycarbonate; and of strips, 2 mm thick, laminated at high pressure and veneered, made from either stained beech veneer or walnut. The wood and aluminium are bonded together using solvent-free polyurethane adhesive. The trestle is made from stained solid natural beech or walnut veneer.